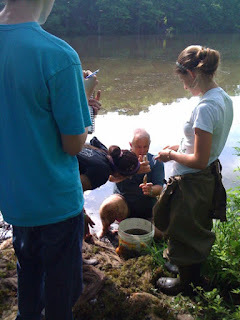 Thanks to Tim Anderson, Princeton High School science teacher, who sent me these photos of his May 25 visit to Mountain Lakes with his students to study the lakes before they get drained this July as part of the upcoming dam restoration. 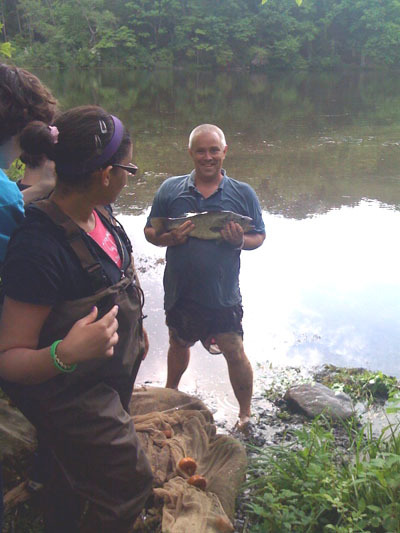 Tim has often used Mountain Lakes as a study area for his classes. This year, they sampled "fish, plankton, etc." In two seines of 80 feet of shoreline, they caught "a 22" large mouth bass (see below), hundreds of bluegill and pumpkinseed sunfish, one green sunfish, white suckers, golden shiners, and one 14" bullhead catfish." 22 inch largemouth bass. This may be the big one fishermen have told me they've seen in the lower lake. 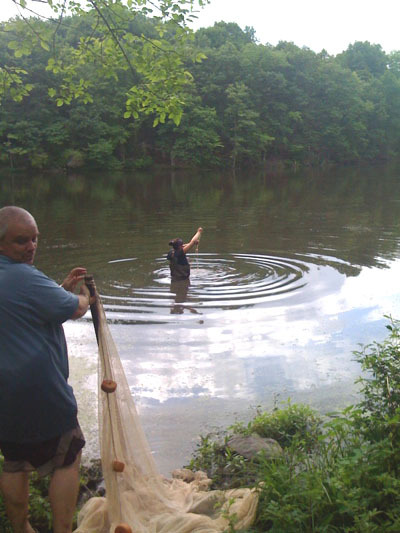 My understanding is that the fish will be rescued from the lakes during draining, and transported to Carnegie Lake. Though the lakes will be restocked after the restoration is complete, I've been told that it will take some years for fish populations to recover. I had wondered whether there might be something genetically special about the fish in the lake, since the dams have effectively isolated them from the rest of the watershed for the past 110 years. But I was unable to find anyone who thought it worth looking into. In any case, it's good to have some information about what lives in the lakes, before they get remade. 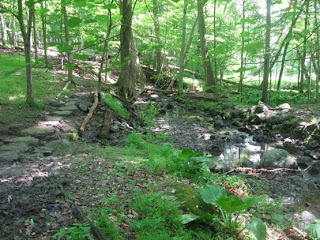 Thanks to the hard work of volunteers, and some serendipity, one of the prettiest spots in Princeton's Mountain Lakes Nature Preserve is now accessible by trail. Walk up to the end of the long paved driveway leading from 57 Mountain Avenue to Mountain Lakes House. Just past the house, veer right into the woods on the new trail. It will take you past tall red oaks, then down into a small valley I've started calling Frog Hollow. On May 23rd, the trail's stream crossing was given an extraordinary facelift by 18 volunteers--8 from the Friends of Princeton Open Space and 10 from the NJ Trail Association. The NJTA group was led by Alan Hershey. 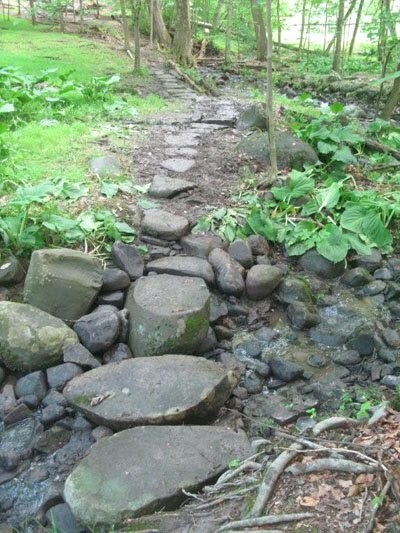 Hikers and joggers in Mountain Lakes will have noticed great improvements in all the preserve's trails over the past couple years. Much of this has come about through the leadership of FOPOS board members Ted Thomas and Clark Lennon, who are out almost daily in the park, working on their own or with additional volunteers on periodic workdays. As can be seen from the size of the rocks used, this is probably the most ambitious and elegant project to date. The element of serendipity came in the form of the recent windstorm, which blew so many pine trees down across the old trail to Witherspoon Woods that a new one had to be built. The new trail goes through far more interesting terrain. 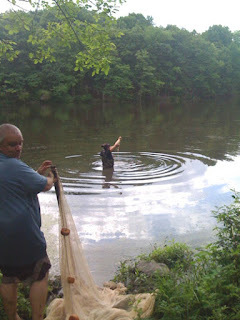 On May 24th, the Princeton Township Committee specially recognized Helmut Schwab, Robert von Zumbusch and the Friends of Princeton Open Space at its meeting for their contributions to the creation of the Stony Brook footbridge near Jasna Polana/the Hun School, and for developing the concept of a loop trail around Princeton. Helmut came in for special commendation as the person without whom it would not have ever happened and for his long years of work on the project, and Robert for his help as a member of the Historic Preservation Commission in working out those aspects of the project. Robert Kiser, the Township Engineer, received an award from the NJ Engineers’ Society for this project. A lot is also owed to Anthony Soriano, another member of the Engineering Department, who – starting when he was an intern – successfully put together grant applications that provided 80% of the total funding. 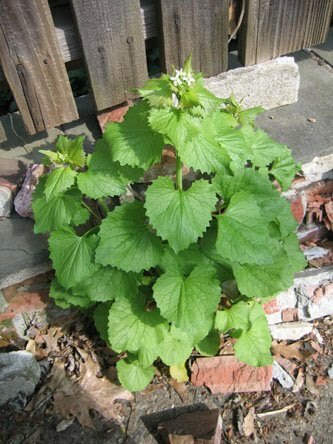 Garlic Mustard Pulling at Mountain Lakes--Recent rains and a sunny forecast will make for a good day to pull this aromatic and edible, but highly invasive species in one of the lovelier spots in Mountain Lakes Preserve. It's shown in the photo growing out of cracks in a patio. Pulling now, before the seedpods open, will make for fewer weeds next year. Kids can help out with this sort of work. Meet at Mountain Lakes House (end of long driveway at 57 Mountain Ave). Directions: From Princeton take Alexander Street toward Route 1. At the bend before the canal turn right on West Drive. Go a short distance on West Drive and park near the entrance to the Rogers Wildlife Refuge. Native plant sale at D&R Greenway. Lots of native species to buy, most of which have been grown from locally collected seeds. Drive out Rosedale Rd to the headquarters at Preservation Place. www.princetonnaturenotes.org -- A writeup on the recent American Chestnut talk hosted by Friends of Princeton Open Space, and a post on sedges (sedges have edges). Friday, May 14, 3-6 and and Saturday 2-5, D&R Greenway will have a native plant sale. Most of the plants are grown from seed collected from local natural populations of the species. For more information, including a plant list, go to www.drgreenway.org. Among other sources of native plants, Bowman's Hill Wildflower Preserve (www.bhwp.org), just across the Delaware River, has a long-standing tradition, and Pinelands Nursery down in Columbus, NJ has both wholesale and retail components. Both of these have plants available throughout the season. Check the websites for details. I'm not one to cultivate obscure tastes, but an interest in plants has led, after a few decades, to sedges, which most people have never heard of. A sedge can easily be dismissed as a green blob, vaguely grasslike--some sort of rank growth where the mowing crews haven't reached. But taking a closer look can be rewarding. What sedge flowers lack in color they make up for in architecture. 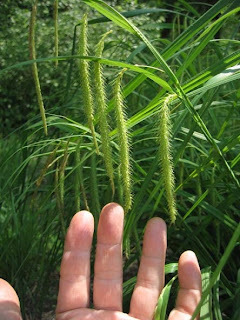 Sedges have edges, which is to say that if you follow a stem down to its base, you will find that it is triangular, in the same way a mint's stem is square, or a rush's stem is round. Here's some of the architecture of one of my favorites, fringed sedge (Carex crinita), whose seeds are assembled in finger-like rows hanging gracefully from the tip of the stems. 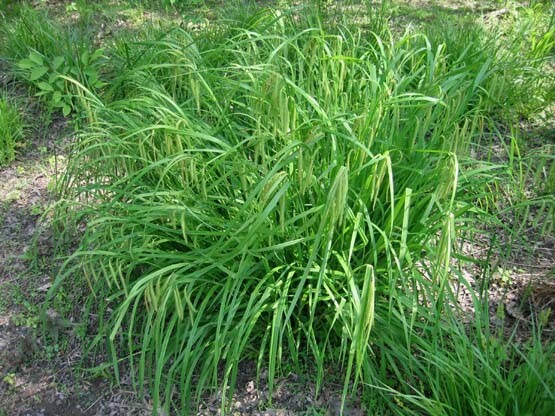 Like most sedges, this one likes wet ground, and if there's some sun, all the better. 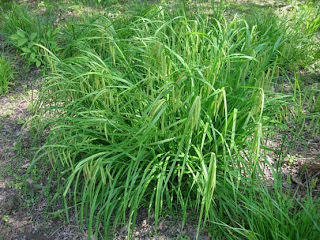 While having some grace and beauty, fringed sedge is also a very tough plant, and is often used to advantage in wetland restorations. Sandy has been studying American chestnut blight since 1968--a passion that shows no sign of flagging. While devoting her life to bringing back the American chestnut as a timber tree, she loves all types of chestnuts--American, Japanese, Chinese, European, and the closely related chinquapins. She began by taking us back 13,000 years, to the end of the last ice age, when the American chestnut was likely limited to a small area in what is now Tennessee. As the glaciers receded, the chestnut spread across the east. American chestnut was the perfect timber tree. It grew straight and tall, and was highly resistant to rot. It was the main wood used for telephone poles and fencing in the east. Chestnut was the quickest to regrow after a virgin forest was cut down. Shading out other species, it became the dominant tree in second growth forests. The first imported disease affecting American chestnuts was not chestnut blight but something called Ink disease, which hitchhiked over from Portugal on cork trees around 1824. It's a deadly disease, but can't survive the colder winters of the northern U.S. Chestnut blight likely came to this continent around 1876, when Japanese chestnuts began being imported. It spread quickly through the eastern U.S. In Connecticut, Sandy's home state, it spread statewide in just four years, from 1908 to 1912. The blight essentially stripped American forests of the chestnut tree, but did not kill the roots. The species literally "went underground", sending up shoots that would grow for some years before being infected by the fungus. One can still find this sort of sprouting in the woods. The disease later spread to Europe, arriving in Italy in 1938. In 1951, a European scientist discovered that some chestnuts in Italy were showing a different reaction to fungus, exhibiting swollen cankers. Trees with this sort of canker were able to grow despite the presence of the blight. When Sandy heard about this less virulent strain in 1973, she contacted the scientist and helped identify the virus that was causing the reduced virulence. This was a particularly important discovery because the virus can be applied to American chestnuts to reduce the impact of the blight fungus. Sandy's approach to reintroducing the American chestnut is not to plant whole forests with resistant varieties, but instead to preserve the genetic diversity by planting a few specimens with bred resistance into an area where there are remnant populations of the pure native species. By treating the non-resistant pure natives with the virus that reduces the disease's virulence, a mix of bred and pure species can survive and cross-pollinate. I asked about the potential for identifying the gene in asian chestnut species that makes them resistant to the fungus, and then inserting that gene into American chestnuts. She said researchers have found three genes associated with resistance, which makes genetic modification more difficult. It's her experience that the traditional method of breeding resistance is actually faster than doing genetic modification in the lab, and will yield better results. The added benefit is that she gets to work outside, rather than in a lab. As if the introduced diseases were not enough of a handicap on the American chestnut, someone smuggled plant material into the U.S. in 1974 that included an exotic insect called the chestnut gall wasp. The wasp spread through Georgia, got accidentally transported to Cleveland, Ohio, and is now heading towards the northeast from those two directions. Though there are parasites that prey on the wasp, Sandy is worried about its potential impact on efforts to restore the American chestnut to the eastern forest. The fungus that causes chestnut blight infects oaks and eucalyptus as well. Bill Sachs tells me the chestnuts we can buy for eating come mostly from Italy. The American chestnut is smaller but sweeter. Sandy mentioned the "Sleeping Giant" variety that makes particularly good nuts for eating, and is partly American. 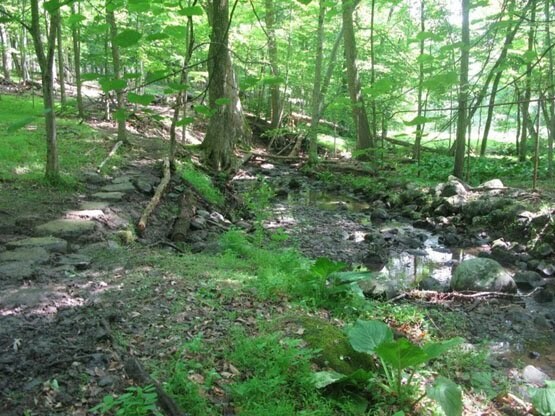 Here's another project in Princeton to bring back the American Chestnut. Thanks to Debra Costa for the information. "I am heading our Stony Brook Garden Club project in our effort to help with restoring the American chestnut tree. All GCA clubs have an initiative to do some kind of civic tree project as a celebration of the 100th anniversary of the Garden Club of America - for 2013. We planted about 50 seeds on Sunday in Greenway Meadows Park. The seeds were provided by Sara Fitzsimmons from Penn State University. She is involved in their research project of backcrossing toward the goal of a disease resistant tree. They are in their 6th generation of backcrossing. She heads and visits volunteer orchards connected with the project at Penn State. At Sara's recommendation, we planted pure American seeds (not blight resistant) because of the need to maintain/provide a biodiverse germ pool of seeds for their back-crossing project. In time, with success of this "orchard" we can transition to blight resistant trees as they become more available." A reminder about the talk this coming Thursday, hosted by Friends of Princeton Open Space at Mountain Lakes House, about efforts to bring back the great American Chestnut tree. The talk is free, and refreshments will be served beginning at 6:30. Below is some detailed background information, provided by Bill Sachs, who lives in Princeton and edits the Northern Nutgrowers Association newsletter. trees is a long process, but significant progress has been made. with resistance genes from our timber hybrids. Agricultural Experiment Station in New Haven, Connecticut. Agronomy degree at Justus-Liebig University in Giessen, West Germany in 1985.
fungus and resistance in the trees. She continues the Experiment Station project on chestnut tree breeding to produce better timber and orchard trees, and is the International Registrar for cultivars of Castanea for the International Society of Horticultural Science. Her current research has expanded to include canker diseases of butternut trees in Connecticut.